We are on a read aloud roll around here lately and were so happy to be able to add another great book to our library. Imagine. . . The Great Flood by Matt Koceich from Barbour Publishing was enjoyed greatly by my 7th and 8th graders. It is a nice, short, simple Middle Grade Fiction chapter book suitable for ages 8-12. It consists of 15 chapters in 110 pages. This is the first Bible Adventure book in the Imagine Series. The author is a schoolteacher and missionary. 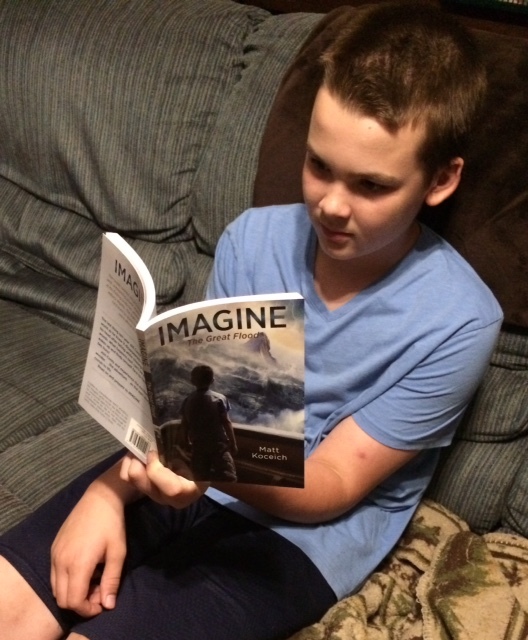 Ten-year-old Corey is our main character who embarks on an adventure of a lifetime. Imagine being part of history and getting to know Noah and his sons and see what Noah's Ark was all about in person! Corey's family is getting ready to move from Texas to Florida. Corey is not happy that he will be leaving everything he knows and all his friends. His mom tries to convince him that God has a plan for them and things will work out but Corey is not buying it. He takes his dog Molly on a walk to the park. His mom continues to try to explain to him that God is in charge. Corey does see that analogy between trusting in God and his dog Molly trusting him to lead and guide her through any and all danger. It is getting ready to storm outside and as he chases Molly in the park he ends up falling and hitting his head. When he wakes up his mother and Molly are nowhere to be found and he finds that he has been transported back to 2400 BC in Mesopotamia! He is faced with two lions and asks God for mercy in this situation. It is at this moment he meets Shem! Yes, Shem from the bible. Shem, Noah's son. Yes, Noah from Noah's Ark! Shem explains that things are different and the animals are not fierce. Shem also introduces Corey to his brothers, Ham and Japheth and later his dad, Noah. Shem warns Corey about the Nephilim, the giant hulk like superhuman creatures that are out to get them. The Nephilim are huge, about 10 feet tall, and they carry large swords! This story keeps you on the edge of your seat as you follow Corey battle it out with the Nephilim over and over. He remembers his mom's words, "Rely on God, Rely on Him, Corey. He never changes." God has a plan. His plan is that Noah and his sons preserve a remnant and the Nephilim will do whatever it takes to stop that plan from happening. Corey misses his mom and just wants to go home. He still doesn't understand how he even got to where he is. After Shem talks to Corey about God being a promise keeper and the importance of trusting in Him, Corey starts to realize that maybe his family's move to Florida was indeed in God's plan for their life. Shem also reminds Corey that we must be obedient to God and not lose our faith in Him. We soon meet Ardad who seems to be a friend to Noah and his sons. Ardad is able to communicate with the Nephilim. They ask Ardad to try to keep the Nephilim away from them as they complete the ark. Ardad mentions the help of Elizar (whose name means The One Who Deceives) who is a sorcerer of some sort, but Shem declines his help. As the story progresses and the Nephilim continue to attack, Corey comes to many realizations that relate to what he is experiencing. He begins to see the "big picture" and that God really is in control and that if he puts his trust in Him, things will work out one way or the other. With no weapons to fight the Nephilim Corey realizes that he must rely on prayer. When Corey finds himself in a tight spot Elizar appears and offers to help. He assures Corey that he is the answer and can control the Nephilim. Thankfully Corey realizes that Elizar is not the answer and that relying on God is his only hope. Elizar reminds me of when satan was tempting Jesus. He keeps telling Corey that he has the answers and can even get him back home. Just when Corey is about to accept Elizar's offer, Ardad steps in and interrupts him. Corey trusts Ardad to get him to safety but soon finds out that he too betrays him and turns him back over to Elizar and the Nephilim. Corey finds himself thrown into a well with no way out. The flood is coming and his death is inevitable. In his deperation he realizes that only God has the answers and he cries out to Him for forgiveness and for Him to save him from his mess. He remembers a story his Grandpa told him of the power of forgiveness. The story is full of excitement and drama. My kids (7th and 8th grade) really enjoyed it and hated the cliffhangers when we would stop reading for the day. It will keep you wondering and guessing as to what Corey's fate will be. Does he survive the Nephilim? Will he be rescued? Does he get to go back home? Will he ever see Molly and his mother again? I encourage you to pick up a copy of this Christian Fiction for Kids book for your homeschool reading collection. We really enjoyed reading Imagine. . . The Great Flood, a great Kids Fiction book. It is a good reminder of the power of God and forgiveness, the importance of trusting in Him, and that He does indeed order our steps. Corey learns a lot of valuable lessons that your kids can understand as he carries you through his harrowing story. It's a great example of Bible Stories for Kids. You can connect with Barbour Publishing on FACEBOOK, TWITTER, and YOUTUBE. Please be sure to check out the other reviews. See banner below.